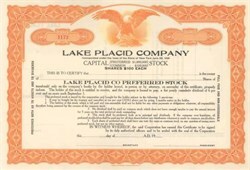 Beautifully engraved unissued certificate from the Lake Placid Company printed in 1920. 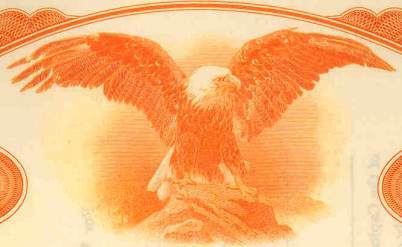 This historic document was printed by the American Banknote Company and has an ornate border around it with a vignette of an eagle and is over 75 years old. With help for many years from the Club, Lake Placid has grown into a strong four season destination resort, world famous for hosting the 1932 and 1980 Olympic Winter Games. Surrounded by the dramatic natural beauty associated with the mountain areas of Europe, Lake Placid now stands on its own in attracting National and International sporting events and competitions. Melvil Dewey imported skis; built toboggan runs; had separate skating rinks for curling, hockey, and figure skating; and built the original ski jump at Intervale. Each year collegiate competitions drew crowds up to two thousand to watch jumpers fly over 160 feet. Melvil's son Godfrey was the President of the 1932 Lake Placid Olympic Winter Games, some giving him single-handed credit for bringing the 1932 Olympics to Lake Placid.